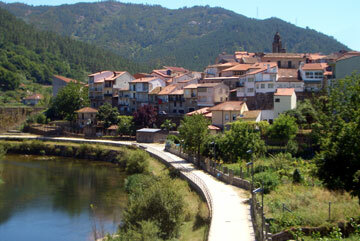 Here are a few more pictures of this great Galician town in the Ourense province (not uploaded yet). Photo 1. 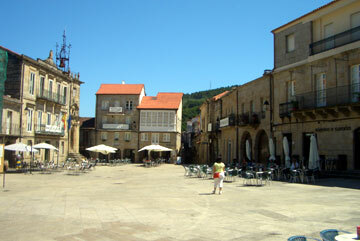 The main square or plaza in the extensive old quarter of Ribadavia. 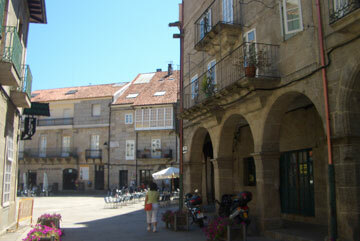 This has to be one of the best plazas in Galicia. It has a number of bars and restaurants and is purportedly the center of the Ribeiro wine region! Photo 2. This is a view showing one side of the old district adjacent to the river. It was taken from a bridge that is crossed as you enter the town. Photo 3. 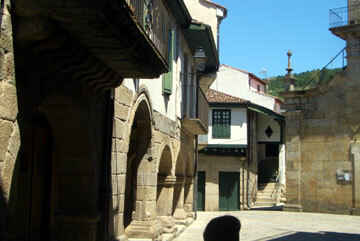 A picture showing one of the colonnades that are common frontings to many of the older buildings in Galicia. Ribadavia has many of these and they are ideal if you are having a drink or something to eat on a hot day and you want a bit of shade. Photo 4. The old town is made up of many narrow streets and alleys. This is one example. What the photos do not indicate is the steep slope that the old town is built upon. Photo 5. Ribadavia had a significant Jewish population in the middle ages and there are many small signs and symbols of that legacy that remain today. 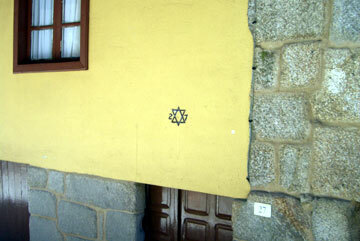 This house wall has the property number and the star of David indicating that its owners were once Jewish. In fact there was (and remains) a Jewish district in the town. The Spanish inquisition had a big impact on the population of Ribadavia, but unlike some of the more cosmopolitan parts of Spain, those who were not Roman Catholic were not always killed. Many of the Jews in Ribadavia were given the opportunity to change faith in order to save their businesses, and in many cases their lives, and for that reason the town's diverse cultural heritage was saved. Faiths did not always change though, and in many cases the practicing of non Catholic faiths simply moved underground.